Kitchen Floor Design..... The kitchen is a pretty demanding environment for any floor and your kitchen floor takes more of a beating than any other floor in the house. Not only is it subject to water, food (and dare I say..... red wine) spills, it also suffers the constant battering of feet as we spend hours each day preparing food, cooking and washing up. The kitchen floor is also bombarded with brooms, brushes and harsh chemical cleaners to keep it "germ-free". Will it be easy to keep clean? Will it be comfortable to stand on for hours at a time? and then most importantly, will it flow with the rest of the kitchen and home? A kitchen floor has such a big impact on the kitchen's overall look, but you have to consider the practical side of it too. The best kitchen flooring choice will be one that flows with the existing flooring from the rest of your home in either colour and style; bearing in mind that patterns and textures do not compete with other focal points in the kitchen. 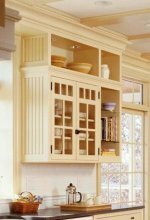 Through careful planning, you can select a pattern or design that can be repeated throughout the kitchen and even adjacent rooms. The kitchen floor design is not separate from the rest of the kitchen; it is important that it fits into the overall design to create the desired effect. The information I present to you here will help you to plan and design a kitchen floor that not only meet your needs; in looks as well as in practicality, but that will also add real value to your home. Normally I am not one for extravagant designs and outrageous colours or textures. 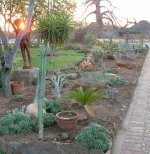 From my other pages you will know that I like earthy colours, and simple African designs, but that doesn't mean that I never dare to be different. And the kitchen floor design is where I think everyone should allow the creative side of their imagination to roam free..... even if it is just a small section of the floor design. Something to make your kitchen stand-out from every other kitchen out there. If you want to make an impact, opt for something unconventional. Just imagine sleek and shiny metal tiles (choose those with a raised pattern to avoid a slippery surface) in front of the wash basin for that industrial look. Even a glass floor in an upper-floor kitchen for the see-through effect. This will add real drama to your kitchen space and allow a lot of light through to the downstairs room. 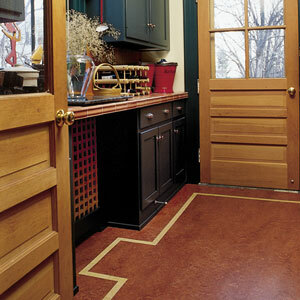 Keep in mind that your kitchen floor design will be with you for a long time, so make the right choice now! OK, now that you have decided on the look and feel, prepared the ground, lets see what material options are open to you to choose from. The kitchen floor is one of the most visible parts of your decor, so appearance is a primary consideration when choosing floor coverings. I would say appearance is the most important consideration; much more so than comfort. I will always go for looks and durability above comfort when it comes to kitchen floor designs. Wood floors are comfortable underfoot, relatively easy to install and competitive in price. If fitted properly, and well finished, theyare also water-resistant and easy to clean. 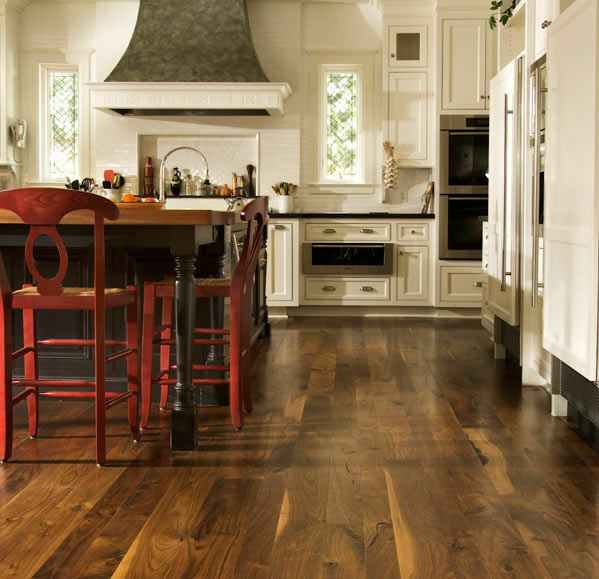 The type of wood finish you choose has a major impact on the floor's appearance. If the wood is naturally interesting, then you will want to finish it with a clear, protective topcoat, such as polyurethane varnish. I always apply three to four top coats. Sand it lightly after each coat. This gives the floor a deep shine and protects the wood against nicks and makes it extremely water-resistant. Or revamp an old, tired wood floor with wood stain or a paint finish. These techniques are easy to apply to any sanded wood floor, and if topped with a good sealant as mentioned above, will last for years and years. A covering of diluted white-wash can also give life to old, dark floor boards. 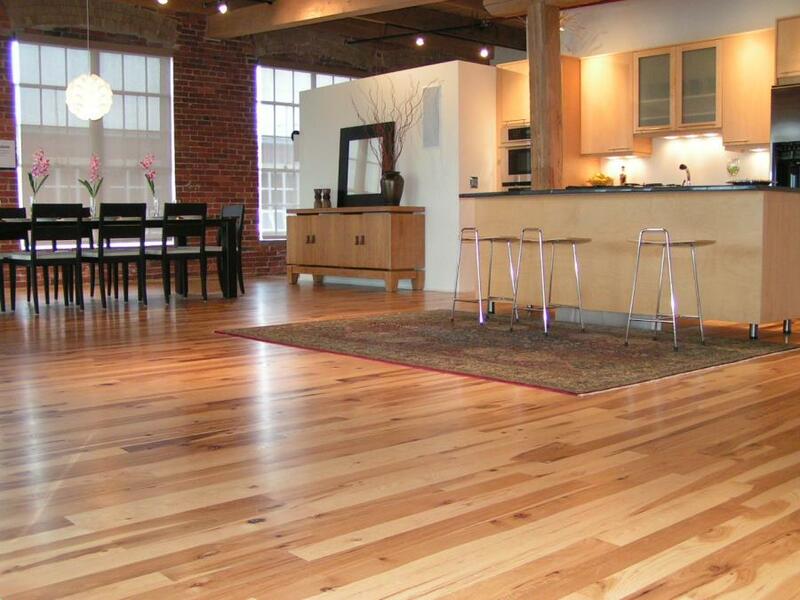 Wood floors need regular and proper maintenance and care and the cost and effort will be considerable over time! As the name implies, resilient flooring has a soft, yielding surface and is warm and comfortable underfoot. It is moisture resistant, and provides a bit of a cushion in the event of a dropped glass (so yes, the red wine is wasted, but at least you can refill your glass immediately.... wink, wink). Laminated and veneered wood are very popular nowadays for a kitchen floor design, as they are far less expensive than solid wood; it is easy to install yourself, and is reasonably durable. These manufactured floors will provide a non-slip surface which just needs a wipe over with a damp mop to keep clean. If you do choose a laminated or veneered floor, make very sure that it is suitable for heavy-wear areas and use the toughest grade you can find. Watch out for water spills; damp will cause the top layer to lift if not dried quickly. Once this type of flooring has been damaged, it is not easily repaired. Linoleum is an extremely eco-friendly material, made of powdered cork and linseed oil. 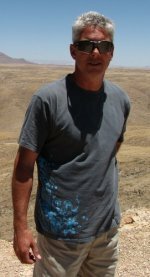 It is completely natural and improves well with age. Linoleum is anti-static and anti-bacterial and hospitals use it extensively in their corridors exactly because of these characteristics. Linoleum can be laid by any DIY enthusiast , but do make sure that your floor's foundation is well prepared as it can be damaged by damp. Vinyl on the other hand is completely synthetic, but very practical, especially in the kitchen. 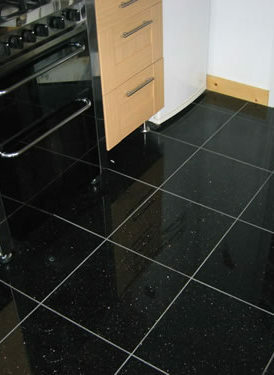 Vinyl is waterproof, very affordable compared to other kitchen floor materials, and easy to keep clean. Vinyl comes in a host of colours and designs. I personally like contemporary vinyl which mimics natural flooring materials like wood, stone or marble. Vinyl needs no sealers and no maintenance, so your up-front cost is a once-off expense. The one down-side to vinyl is that it does not wear very well and can be damaged quite easily. All kinds of floor tiles, whether hand-made terracotta, machine made quarry or ceramic are hard-wearing, easy to clean and are well-suited for the kitchen. Tiles naturally resist moisture and stands up to the high-traffic demands of a kitchen. Ceramic tiles are the most common type of hard flooring used in kitchen foor design, as they are generally the least expensive of all the different types of tiles. Tiles can be laid on any stable, level base and they are reasonably easy to lay. Ceramic tiles also come in an enormous range of colours, patterns and shapes and are available in different sizes and thicknesses. Ceramic tiles will give a clean, streamlined finish to any kitchen; modern or traditional. They are highly practical as spills and paw-prints can be washed away instantly. However, ceramic tiles are brittle and will crack if a heavy appliance is dropped on one.They are also cold underfoot and can be slippery if not treated with a special non-slip finish. Porcelain tiles are harder and more durable than regular ceramic tiles and if your budget allows for it, I will definitely recommend them . Porcelain tiles are difficult to install and not for the fainthearted. I always leave this to a professional that specializes in porcelain tiling. Handmade terracotta tiles are also warmer, but as they are porous, they need to be sealed properly. It is also not easy to replace a broken tile as it will be noticed immediately. The terracotta gets darker with age and wear and any replacement tile stands out, but it definitely gives character to a kitchen. Beautiful, durable and timeless, stone is a popular choice for the kitchen floor design, especially if you want to fit underfloor heating. Stone loses its heat slowly and is therefore ideal to use with underfloor heating. Stone is a non-renewable natural resource, so expect it to be pricey and it definitely needs expert fitting too. But if you do choose a stone floor you will know that it is unique and will add tremendous value to your home. Stone tiles present a diversity of looks and textures. By far the most popular stone floor tile, granite comes in an array of interesting colours; from subdued greys, to purples, deep greens, blue, pink and near-black. Granite features course-to-fine speckling, and striking mottled patterns and the finish can be high gloss or a non-slip matte. Ensure that the finish is either honed or dulled, rather than polished, in order to make them less slippery when wet. Granite is durable and stain and water resistant but it can become slippery through wear. I however doubt that a granite floor will wear in any kitchen, no matter how busy it becomes or how much it is bombarded with brooms, brushes and harsh chemical cleaners. Another drawback about granite floors is that the sound will bounce directly off them, so it is not advisable to use a granite floor with stone tops and vaulted ceilings, as the kitchen conversations may become a deafening affair! Limestone and sandstone are similar types of stone and is an alternative to granite and marble. It is more susceptible to wear because they are softer but both provide a warm feel and a sophisticated appearance. Limestone and sandstone are both porous and should be sealed to prevent moisture and dirt from infiltrating. 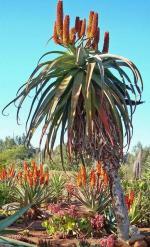 They come in restrained hues limited to tans, beiges and greys and is good for offsetting a dark kitchen. When I was a child, you would never have thought to use slate inside the house for a kitchen floor; it was limited to outdoor use. It is a good thing that trends change with time though, as slate, with its huge range of colours and textures adds a tremendous atmosphere to a kitchen floor design. Slate is hard and dense and vary in colour from saturated jet black to dusty reds, blues, and greens. 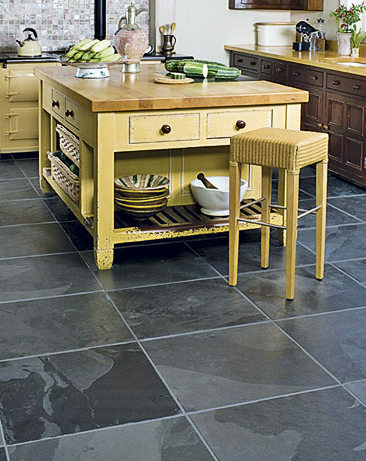 Slate is arrestingly beautiful, resistant to moisture and stains when sealed properly and good at hiding dirt. Considered the king of tiles, marble screams luxury and is the ultimate glamorous extravagance as a kitchen floor design. is where I would rather use marble, but it is definitely an option for your kitchen floor design. Terrazzo is a man-made, composite flooring material created by blending marble, granite, quarts or glass chippings with cement. Terrazzo is then cured, ground and polished to a smooth, uniformly textured surface and works brilliantly as a kitchen floor and should at least be considered for every new kitchen floor design. Because it is man-made, it boasts an impressive, nearly limitless variety of colours and patterns. It is extremely hard-wearing and non-slip (just don't use wax to polish it as that will make it very slippery, especially when wet). 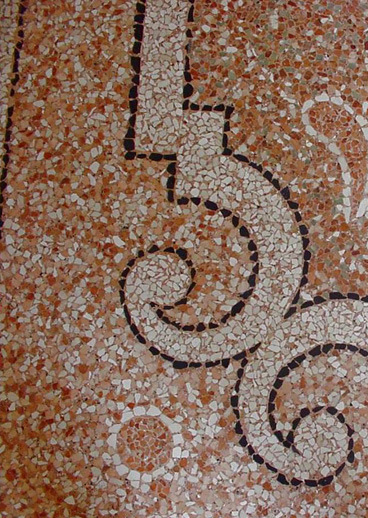 Terrazzo is most often blended and laid as a complete floor on site, but it is also now available in slabs and tiles. Laying different coloured tiles next to each other or in a specific patterns will give it a unique look and feel. Once it has been finished with a sealer, it just needs a wipe with a mop and voila, it is clean. 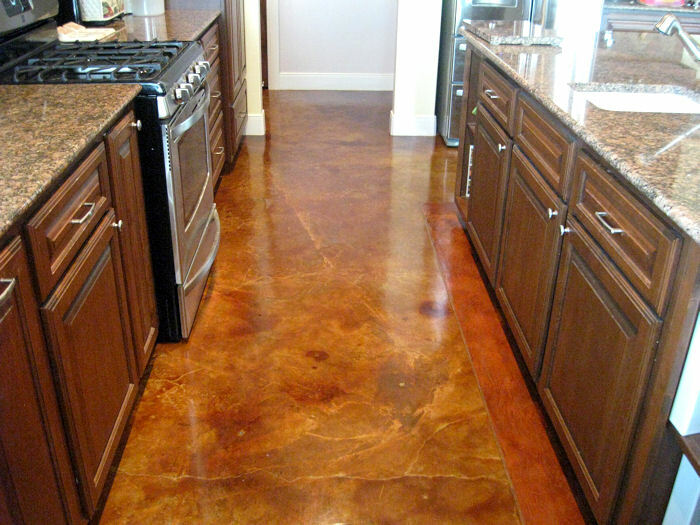 Concrete can be the used for the ultimate kitchen floor design. 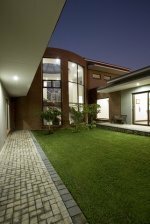 A blend of cement, aggregate and sand, concrete can be made in a variety of textures and colours and once polished and waxed, it becomes beautifully smooth with a glossy surface. For a smooth and even finish I recommend you have it laid on site by a company specialising in concrete flooring. Once the slab has been laid, there are a variety of products that the DIY enthusiast can use to give it a professional finish after which you have a sleek, durable and extremely low maintenance floor to admire for years to come.